Coaxial reagent disk Unique coaxial reagent disks design making reagent replacement time saving and convenient. The semi-opened cover ensures operator safety during operation. cient reagent aspiration through liquid level and reagent bubble detection technology. Dot light source The dual focus of forward lighting is possible via the dual-diaphragm and dual-lens technology which creates a high intensity focused light. Thus, lower the minimum reaction volume and enhances measuring accuracy. Water quality monitor The system employs resistance principle. It provides premium DI Water quality for assay analysis and reduces potential contamination. Large sample capacity Total sample capacity is 440 (140 positions on the sample tray and 300 positions on the Sample Delivery Module). 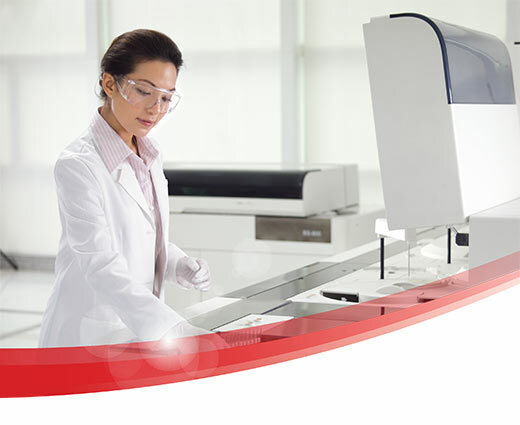 The Sample Delivery Module automatically delivers samples to the analytical unit. The large sample capacity coupled with 165 washable permanent cuvettes allows the operator hours of walk-away time. Low reagent consumption Uniquely designed reagent bottles maximize reagent usage and reduce residual volume. One key STAT Dedicated One-Key STAT test button, STAT sample position, and STAT sample rack provide prompt response to the highest priority samples. Continuous reagent loading and unloading Two separate buttons independently control each reagent carousel; it ensures safe and continuous reagent replacement during testing. Indirect ISE Low sample volume, high ISE analysis throughput, and cost-elective electrodes. Each electrode supports up to 30,000 total test volume or three months.